These hot-dipped galvanized buckets are crafted with three main components to enhance durability. These include a reinforced wire rim, offset bottom, and body swedges. A sturdily attached handle makes these buckets easy to use for years and years, especially since they are rust-resistant and guaranteed watertight. They can be used to carry feed, tools, or anything else that demands a durable method of transportation. Afterwards, this bucket can also be filled with seven wine bottles or ten drinks for your next cookout or get-together. 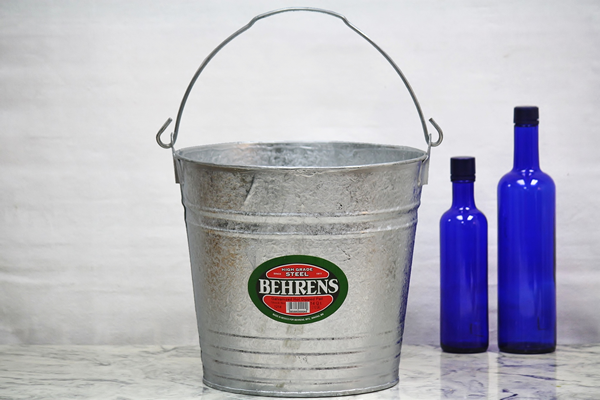 We also offer this bucket in 8 quart, 10 quart, and 12 quart sizes. See the smooth-finished 14 quart electro-galvanized steel style here. Note: This bucket's rough hot dipped galvanized finish may result in sharp edges. I needed some new buckets for sheep feed a while back and bought a few of these. They are pretty sturdy and has lasted this long with no problem.